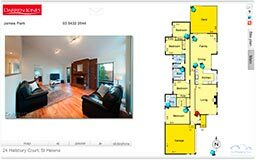 iFloorPlan enables you to quickly and easily create interactive floor plans with your photos and floor plans. Registration is free and includes credits to create and publish 2 interactive floor plans. 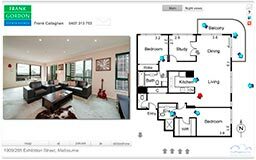 Make sure your clients (and everybody else) knows who made your interactive floor plans. Add your logo with a click through to your site to every iFloorPlan you make and include your domain in the link you send to your clients. And you can add your client’s branding too. Create your library of logos, links and contact details so you can quickly include your client's branding. Use our default template or drag and drop elements to create your own unique layout. Add a little colour to the frame, text or background and save it as a template. Designed to work with your business. Delivering your iFloorPlans to your clients is as simple as it can be. Your iFloorPlans are hosted on our servers and served through our CDN. You only need to send your clients a link that they can then use in the property listing. A friendly user interface that requires no training and no downloads. 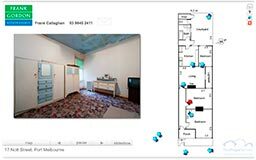 Creating a great looking, information packed virtual tour of any property, is an intuitive, step by step process. All you'll need is a floor plan and some images. Once created, your iFloorPlans last forever. It is free to republish an iFloorPlan for another 365 days. So if you have properties for rent like holiday houses or AirBnB aprtments you can keep your iFloorPan live forever. You can update your iFloorPlan at any time. Looks and feels great on any device. Smart phones, tablets and desktop computers are supported. iFloorPlans scale perfectly to any screen size and resolution. 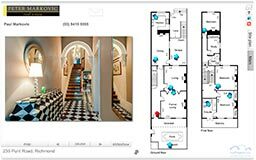 Create an iFloorPlan without registering, watch a demonstration video or register now.